This is an ongoing project between Henrik Hellstenius, Victoria Johnson, video artist Mattias Arvaldsson and Edvin Østvik, programming. Premiere performance of Victoria Counting I 6.9 2007 Parkteatret, Oslo. A new version will be performed at Vinterlyd at NMH 26.2 2009. The Armenian philosopher and mystical Georges Ivanovitch Gurdjieff once gave a student the exercise to count from 1 to 50 and backwards seven times. This exercise should show the student how difficult it is to concentrate even on something that easy as counting. Continuous streams of thoughts, memories and associations try to take away our concentration. The composer Henrik Hellstenius has provided violinist Victoria Johnson with a piece based on this counting exercise, where also domestic sound from her familylife are mixed in. How do you keep artistic focus and be a mother of a little child at the same time? In the new version of the piece, the material goes beyond the private sphere and into the public and philosophical. The video amplifies, transforms and illustrates the inner and outer disturbances. The audience is placed around the performer, and one of the future ideas we might try out is that distance-sensors on the music stands will control the spatialization of the sound when the violinists moving towards the music stands. The piece includes video, text, 4 channels sound, soundprocessing and objects. We will work with director Jon Tombre towards the concert on Vinterlyd. Yesterday we had a meeting with video artist Mattias Arvaldsson at NMH, looking at the hall and planning possibilities of combining audio and visuals, and how we will not make an overkill of expression by combining so many different parameters. We will use 4 screens behind the audience projected from the front, and probably parallel screens will show the same visuals. In this project the creative cooperation between performer and the piece “In statu nascendi”, the evolving of the work. The project questions the idea of the closed and finished piece focusing on a cyclic development process where one performance gives the direction of the next. It is not the development of the piece we are a witness to but the performers possession of it. The videopart is to be developed by Ellen Roed in the nearest future and will explore the musical theme further. Both musician and composer are on stage performing together and their roles has been defaced. 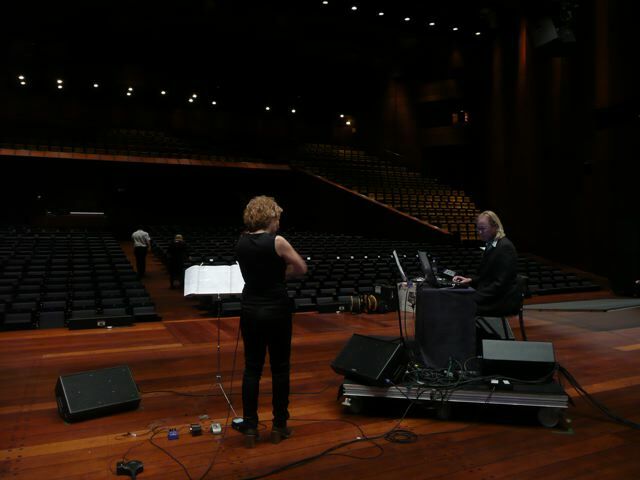 Victoria Johnson el-violin, Thorolf Thuestad, live electronics, HC Gilje, video. the performers having much freedom. The composer’s role is like a director or a source of musical inspiration. The piece does not have musical time but navigates freely through the soundscape. I played this piece in the concerthouse with video and at NMH and in Theatre in Basel on the two Fat Battery concerts without video. I will play it again at the Fat Battery concert in Mannheim on November 24. I will come back to updates on the concerts this Autumn soon. I have used this year to clarify the content of my project in different ways. It has been done by the development and collaboration with the composers and video artists as well as using the concerts as an arena of evaluation of the project. The exploring of the sonic potential of the electric violin when it is combined with electronics has been the main topic. The concerts have been both of formal and experimental character. I have used the concerts with Fat Battery to experiment and fulfill ideas that need to be explored in my project. The solo performances have been of a more formal character. I have realized that use of extended playing-techniques works very well when it is manipulated through the computer. This work is documented in several presentations and concerts. I have also worked on extending the instrument with the use of the real-time interactive sound processing soundprogammes Max/Msp and Ableton live. This work has made it possible to perform and improvise more freely with the computer than before. Apart from the sensorbow my research has during this year also been to get further knowledge about other possible controllers usable for a violinist. Together with Alexander R Jensenius (New interfaces for musical expression) I will continue this reserarch.This work has also included midi to control different parameters in the live electronics. It has been very stabile and to most extent flexible. In this processes it has been clearer what my research questions is, and what II will have to fullfill artisticly to come to a conclusion in 2010. I would formulate some of the question which has emerged during this year as follows: What kind of new soundscape will emerge when electric violin is combined with interactive sound -programs? What is a digital space compared to a natural space? What happens with the musical score when it transforms from a linear to a modular one? What happens with the musical time and space? How has my role as the performer changed in the process of working with the composers when improvisation is involved in the new repertoire for electric violin? What is the language of improvisation of this new soundscape? How does it work when visual art (video) is used as a starting-point for improvisation? Does music and video have a common language? Where can this art-form be performed in a concert-hall/ as a concert-installation/ in an Art galley? How do I work with spatialization of the sound and how can I control this in my own improvisations? What kind of controllers is stage worthy for a violinist?